How Do I Host A Motion Comic On My Website? I know this forum is dead, so I don't expect an answer for a while. Generally you choose the 'Export HTML5' option in the File menu, choose (or create) a destination folder for the resultant files, then [after export] upload the contents of that folder to your web-host/server (either in a subfolder, or the site root ~if the host/domain URL should lead directly to the comic). If you choose a subfolder, then include a link on your main page to the project's index.html file. To upload you can usually use an FTP client [easier], but you should also be able to do it with their web administration as well; so long as you faithfully recreate the same folder structure and place the files from each into the same places on the web-host. Unfortunately, I recreated the file structure using the web administration... just like the files you show there... but it's not working. I get a 404 file not found error. How can I double check if everything is where it's supposed to be? 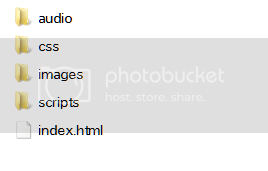 Also, how does the index.html file know where to find all the assets, such as CSS, Scripts, etc.? Do I have to edit something in that file? The particular structure and files I've shown is what comes of exporting the default demo project; it might actually be different for yours. You need to upload the entire output of your exported project [as-is] to a web-accessible location on your web host. **One possible ~Gotcha~ is that the Windows file system is not case sensitive, but the Linux/Unix system is... So if any directory names, index.html, or its linked scripts & CSS references contain upper or lowercase letters that don't match the actual path/file names on the disk... The links can fail . I figured out that it was something to do with my web hosting provider. It's all fixed! Works great now. Thanks for your help mechanaut. Your advice SHOULD solve the problem if anyone else reads this thread in the future.